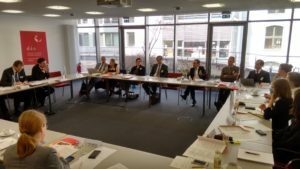 The Roundtable “Investment Facility for Sustainable Development”, organized by DIE on 19 March 2019 in Berlin, brought together senior experts from governments, international organizations and academia. The aim was to discuss options on how current discussions on an international framework for investment facilitation can better promote sustainable development. Investment facilitation is a new issue on the agenda of the World Trade Organization (WTO) and developing and emerging countries in particular are driving this discussion. Investment Facilitation aims to make national investment systems more transparent, consistent and predictable. The Colombian ambassador to the WTO, who chairs the so-called “Structured Discussions on Investment Facilitation” in the WTO, gave an overview of the state of discussions. The subsequent deliberation identified both rules and possible supportive measures for developing countries that have the potential to increase the contribution of a possible international framework for investment facilitation to sustainable development. One of the key conclusions was that an international framework should be designed to strengthen national regulatory systems that are central to promoting sustainable investment. The roundtable is part of a current work strand of DIE on investment facilitation. The event was organized by DIE with financial support from the Deutsche Gesellschaft für Internationale Zusammenarbeit (GIZ).